So for all of you that know me a little bit, you know that I HATE WOPEX pencils. For the uninitiated, WOPEX pencils are not made of just wood, but instead made up of a wood/plastic composite that uses 70 percent wood and the rest is plastic. From the Staedtler website: "Granulates of all components are processed in a special manufacturing procedure. The pencil materials are melted at temperatures between 130 and 180°C, aligned by means of a tool and then moulded to a pencil shape. The initial outcome is an endless pencil strand which is cooled prior to cutting to the appropriate pencil length and then stamped and sharpened." So, ok. It's not a wooden pencil like a Blackwing or a Ticonderoga, but it's a pencil nonetheless, so it should do just job just as good, right? WRONG. I have a few problems with the WOPEX. I dislike sharpening the thing. It's smooth sharpening, but gunks up my Classroom Friendly sharpener and dulls blades on others. I felt bad for this little pencil. My strong dislike for this pencil came from a first experience with it, so really, I had not used a WOPEX for any length of time. I figured I'd give it a second shot and if anything, find some justifiable reasons for hatred other than "it eats my sharpeners." Sharpening the WOPEX was the same experience as I had previously-- it was nice and smooth although I cringed at what it was probably doing to the blade. I spent an entire day writing with it and my bubbling cauldron of hatred seemed to simmer a bit. Yes, I still did not like the thing, but I was beginning to understand why. One of the biggest reasons I use analog tools is because I like the tactile feel of things and the experience as a whole. The WOPEX does not deliver on that. When I write, I do not get the feedback like I do with a traditional wood pencil. The WOPEX is also a bit heavier than the standard pencil and its finish is very rubbery feeling. The graphite in the WOPEX actually isn't that bad. The point retention is great and if you are writing on toothy paper, the WOPEX really shines. Its graphite is a bit lighter than I like, but that is something you sometimes have to sacrifice for point retention. I was pleasantly surprised this week when I was using the WOPEX. Sharpening was a chore and the eraser on the pencil is garbage (not as bad as Musgrave though), but I gave it a chance. Perhaps that is the lesson here. Don't let your first experience with something be your only experience. I still don't love the WOPEX, but I don't hate it either. It does what a pencil should do-- write. A lot of times us reviewers have a limited amount of time with a product due to the fact we want to publish content on a regular basis. I think what this experience taught me was that I need to revisit some of my earlier reviews and see if things have changed. Reviewing something is entirely subjective, so thing can and will change. So yeah. WOPEX. Sorta OK? I have reviewed very few German pencils on this blog, so this week I grabbed a pencil from the jar that would fit that bill. The Staedtler Mars Lumograph is perhaps one of the most accessible higher quality pencils to the non-pencil enthusiast. Found in Staples and most arts and crafts stores, the Lumograph usually comes in a multi-pack with a few different graphite grades. The Lumograph is mainly used for pencil drawing and sketching, but performs very well during everyday use. Subtle yet striking, the Staedtler Mars Lumograph is a bright blue hexagonal pencil with a ferrule-less black tip. The stamping on the barrel is a silver/grey and while pretty, it rubs off quite easily with use. The Mars Lumograph sharpens beautifully and the point does not suffer from any breakage or crumbling. Writing with this pencil is also a joy. It has a nice, smooth lay down and while it smears a bit, it is forgivable since the darkness of the 2B graphite is just right. Erasing the Mars Lumograph is a breeze and my Boxy made quick work of all marks on all kinds of paper (notebook paper, copy paper, Field Notes Shenandoah). The smoothness of this pencil really helped with differential equations notes this week (FYI: I am not that smart, I am a paid note taker. Psych major right here.). I cannot recommend this pencil enough and with the ability to head out to most major office supply/art stores and pick a few up, there is no reason one should pass this one by. I was quite underwhelmed this week when using the Staedtler Norica: point breakage, quick wear, and crappy eraser. 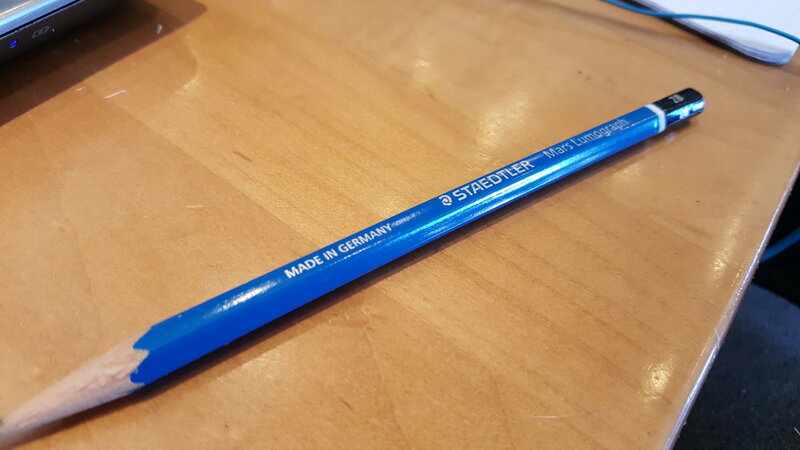 I suppose I expected more out of this German-made pencil (note: this pencil is made in Thailand, I stand corrected), but-- then again-- how much could I expect from a common school pencil? The Norica looks pretty; it has a nice, sharp hexagonal barrel and a bright white eraser held in by a silver ferrule. This pencil had a busy week between stats notes and test-taking that I began to wonder if it could keep up. Since obtaining Kum's Masterpiece sharpener, I have not had the excessive amounts of point breakage as I did the with Long Point sharpener. I chalk that up to less flexibility since the Masterpiece is (I think) magnesium. This was the first pencil that proved me wrong. I deduced that it was probably a break in the graphite core within the pencil since it was such a clean break, but nonetheless this happened about three or four times during the week. Another gripe was the fact that I had to sharpen the Norica so damn much while note-taking. Usually, I sharpen once per side of paper I write on (I use B5 size paper). The Norica sometimes barely made it through two-thirds of the page before I had to sharpen her which left me frustrated and my hand cramped from sharpening so much. I really thought that this pencil would not make it to the end of the school week, but it did-- barely. The picture above shows how quick the pencil wore down (this was taken on Thursday of a week that runs until Saturday). What the above picture also shows is the next thing I am going to gripe about: the ferrule. I usually try to use the eraser if the pencil comes with one to see how it does and whether or not it is useful. I wore down the eraser a lot since it had a hard time erasing and I had to follow up with my Boxy. About halfway through the Norica, I noticed that the ferrule was loose. Like it was separating from the barrel of the pencil. It wobbled quite a bit while erasing or while I was using the pencil in general and I noticed that it was only attached via four little punches in the aluminum (?) that adhered it to the pencil. The smaller the pencil got, the more I noticed the loose ferrule.